Home | Uncategorized | The All Time Lebelik Classics! With over 100 Lebanese designers to date, Lebelik is proudly and happily home of Lebanon’s most talented designers with around 2500 items across a versatile range of products. Let’s start with our classics, follow up by celebrating our emerging designers and design and end up in style by locating and discovering future members of our forever growing family. So many more products to showcase with you, on a weekly basis on our blog platform. 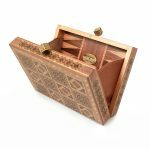 This statement clutch is miniature version of the traditional Mediterranean backgammon board, and is a true manifestation of exquisite traditional craftsmanship. It showcases a centuries-old technique called marquetry where pieces of different types of wood are applied to a wood veneer to form mosaics, decorative patterns, and geometric shapes. A pair of solid metal bronze-colored dice that serves as claps which adds the perfect finishing touch. The clutch includes a small separate leather cardholder. Check out the rest of Sarah’s Bag Collection to complete your look. 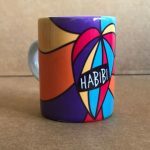 A mix of oriental and contemporary design, inspired by everyday objects that can be found in traditional Lebanese homes and by the designer’s childhood summers spent in the mountains of Lebanon. 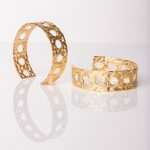 Created by Joe Arida, “La Terre est folle” was launched through the designer’s love for fabrics. Abayas are mostly inspired by Yves Saint Laurent but also by the madness of the world, his travels, Beirut’s character, mythology, nature, people and strong women. 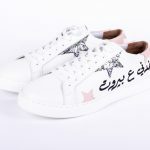 Beirut sneakers embody the bohemian chic lifestyle. Quick anecdote! Rania Tueni-Gebara, creative director of the shoe brand, gave birth to Boho when she realized that her wedding’s location would be problematic for her female guest; seeing as it was located on the top of a steep hill. She then provided the guests with comfy leather sandal that she designed. To her surprise, her problem-solving designs turned out to be a huge hit and everyone was asking more! And here we are sharing with you her latest. LEBELAK IS ON LEBELIK TOO!